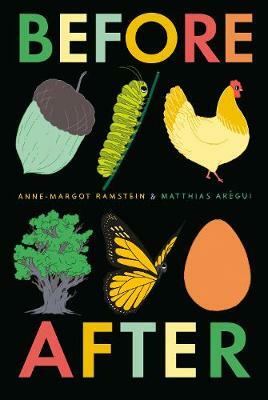 A beautiful, smart and graphic picture book that explores the theme of before and after. Everyone knows that a tiny acorn into a mighty oak grows, and a caterpillar emerges into a butterfly. But in this clever, visually enchanting volume, it's also true that a cow can result in both a bottle of milk and a painting of a cow, and an ape in a jungle may become an urban King Kong. Just as day turns into night and back again, a many-tiered cake is both created and eaten down to a single piece. With simple, graphic illustrations sure to appeal to even the youngest of children, this smart exploration of the fascinating theme of before and after will please the most discerning adult readers, too.